A Green Mushroom: Must Orcs Die? Yes, they must. 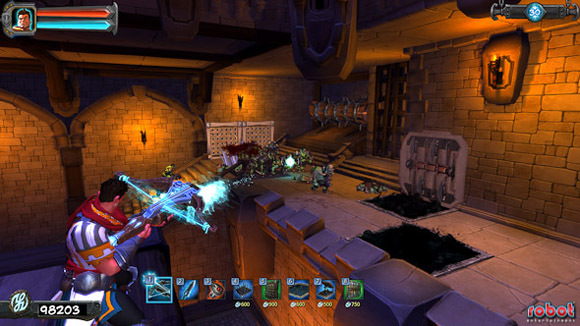 Orcs Must Die is an entertaining hybrid of the tower defense and shooter genres from robot entertainment. I picked it up when it released last month and couldn't put it down for days. I had a blast placing traps and trap combinations for the horde of orcs to stumble into while I head-shot them with a crossbow. The overall concept is familiar. Stop wave after wave of enemies from reaching your exit point. The difference is in the execution. In Orcs Must Die you control a single war-mage on the ground who is entirely in charge of placing traps and killing stragglers. The 3rd person shooter viewpoint made me feel much more immersed in the action compared to the standard high altitude/isometric view found in most tower defense games. As you progress you unlock new spells, traps, and guardians. Points gained from successful defense can also be used to upgrade existing spells, traps, and guardians. It's not much of an upgrade system, and I wish it were deeper, but it's a step in the right direction. If there were more upgrades for each item with different upgrade paths I think it would make for an intriguing upgrade system. I guess I'll have to hold out for the sequel. My only other gripe about the game is the amount of clicking involved. As the player, you want to constantly be shooting at the orcs to maximize your damage to the horde. There is no auto-attack, which means that throughout the game I was constantly clicking to fire my crossbow. It's fine for a couple minutes but gets annoying after that. Fair warning for those with carpal tunnel or repetitive motion injuries. I had a really fun week with the game upon it's initial release, but since then I've been devoting my gaming time elsewhere. Because of that, I would recommend it to anyone who whole-heartedly loves the tower defense genre. It's worth the $15 for you to own it. For everyone else, it's still a fun game but you should probably wait for a Steam sale or price drop before picking it up.